Three thoughts on the Jazz’s 128-125 loss to the Minnesota Timberwolves from Salt Lake Tribune beat writer Andy Larsen. 1. Derrick Rose scored 50 points. How? The Jazz waived Derrick Rose last season after ending up with him in a trade from the Cleveland Cavaliers. The plan was always to waive him, and it made sense: he’s had a negative plus-minus for the last four years, and with his high usage rate, could have hijacked the Jazz’s offense. Even after tonight’s performance, I still think it was the right call. But there’s no denying he was sensational tonight. Rose scored 50 points overall on 19-31 shooting, including 4-7 from 3, plus 8-11 from the free-throw line. The Jazz last gave up 50 points to James Harden early in last season in a road loss to Houston. The Jazz are okay with giving up mid-range shots over the aggregate, but they don’t want them to be uncontested. Too frequently, Ricky Rubio died on the screens the Wolves set, and Rose attacked quickly. That left Rudy Gobert and Derrick Favors some decisions to make, and they chose to leave the iffy shooter open, even though he had shot well earlier on in the game. The Jazz fouled him and allowed him to get inside far too frequently. And when he takes a pull-up three in transition, you’re pretty cool with it, because he’s made exactly three pull-up threes in the last four years. Rose was fantastic tonight, but his performance reminded me of something the economist John Maynard Keynes allegedly said about the stock market: “The market can remain irrational longer than you can remain solvent.” Sure, you can find a market inefficiency, in this case, allowing Rose to take jumpers. In general, that’s a good idea when he shoots less than 30 percent from distance and 35 percent from mid-range. But over the course of one trade, or one game, your market inefficiency may not pan out the way you want it to. You might go bankrupt. Or, if you’ve chosen your career a little better, lose a regular-season basketball game. That being said: you would have liked to see the Jazz adapt to the changing situation a little better. The Jazz are capable of playing lights-out defense, not just math-dependent defense. Tonight, they didn’t have any of the former. 2. Jazz try different looks against KAT, none pay off. And even though Rose scored 50, it could have been all for naught if the Jazz had done a better job defending the rest of the Wolves. Karl-Anthony Towns scored 28 points, shooting 9-17 overall. Towns is a great offensive player, one of the best, so this isn’t too out of the norm. What I did think was surprising was how the Jazz chose to defend Towns with Jae Crowder for much of the game. The idea makes some sense: because Towns is a perimeter-oriented big man, having Gobert or Favors switch on to Taj Gibson or Gorgui Dieng might mean that they can stay closer to the basket, giving the Jazz some rim protection. But what ended up happening was Towns just scoring over Crowder with relative ease. Towns also beat Crowder for an offensive rebound late in the game: Crowder’s not used to boxing out big men. Now, in Crowder’s defense, Towns just scored with ease over Favors a couple of times too. He’s just very good. That was a trend in tonight’s game: the Jazz’s defense wasn’t good with Gobert in, allowing a 115 defensive rating. With him out, though, it was catastrophic: in 15 minutes he was off the court, the Jazz gave up a 135 defensive rating. 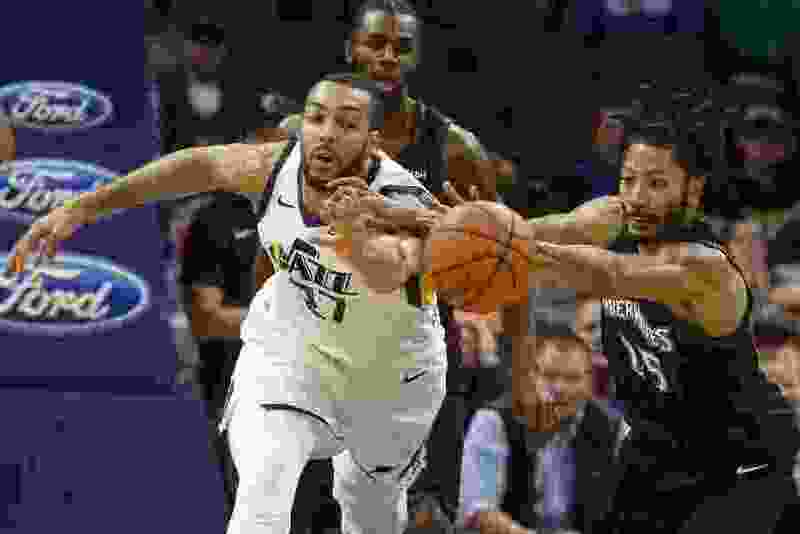 That led Snyder to change his rotation: Gobert actually started the fourth quarter along with most of the bench, and the Jazz actually went on a 8-3 run during that three-minute stretch. Towns will do that to teams, he’s a matchup problem. 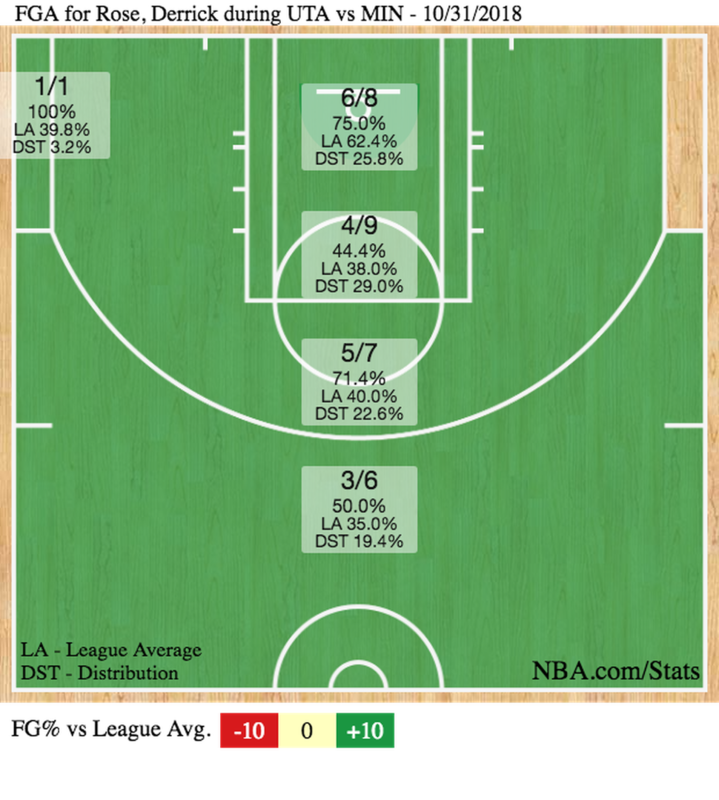 Again, Gobert was very good overall tonight, scoring 22 points on 9-12 shooting. He added six more dunks to get to a league-leading total of 34. The defense improved as noted above, but the offense took even a bigger jump: the Jazz had a 134 offensive rating with him on the court, and an 84 offensive rating with him off of it. He finished as a +13, the highest plus-minus total for anyone on either team. Really, if he hadn’t had picked up two extremely questionable fouls in the first six minutes of the game, the Jazz probably would have won: I doubt the Wolves go on a 14-2 first-quarter run with Gobert on the court. And yet: this isn’t a good shot for Gobert to take in this situation. It’s not a terrible look, I suppose: he has an open look at the basket. But Gobert’s not super adept at making this kind of shot. Down two, the Jazz need to focus on getting the best shot possible. That’s not a Gobert hook/push shot. In the last three seasons, Gobert is 20-68 on hook shots; essentially, you’ve seen him make them before, but it’s not an efficient look. And with 17 seconds on the shot clock, there’s just a lot of time to get something better, especially given that the Wolves' defense wasn’t exactly playing well all game long. Gobert knows better than this normally, but you got the sense that he wanted to put his stamp on the game, to hit the big shot when his team needed it. Instead, though, he made a mistake that hurt the Jazz’s chance at winning in a big way.